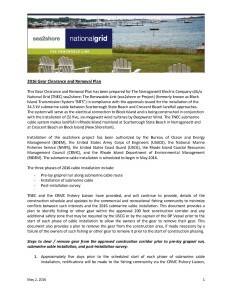 Over the course of construction, National Grid has worked closely with many key marine-related organizations and individuals prior to and during construction. Our goal remains to facilitate open dialogue, ensuring our actions are coordinated with key stakeholders in all project components. We understand that many peoples’ livelihoods depend on the waters, and we want to maintain strong working relationships, even beyond construction. 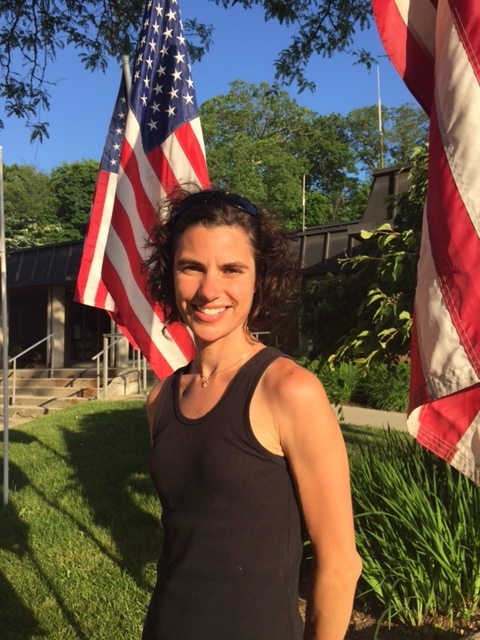 To help maintain an open line of communication with the fishing industry, National Grid continues to work with independent fisheries liaison, Elizabeth Marchetti . Elizabeth’s knowledge of the project and experience on the water makes her an ideal person to serve as a communication bridge. You may have seen Elizabeth walking around the docks at Pt. Judith or attending information sessions through the project’s completion. 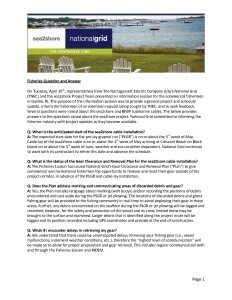 National Grid is scheduled to commence with some additional post-installation marine surveys along the entirety of the sea2shore cable between Scarborough State Beach to Crescent Beach. 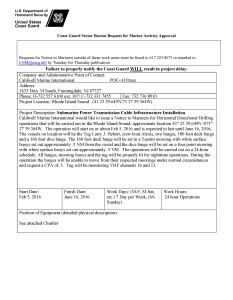 The work is scheduled to begin on Tuesday, May 30 and extend until Sunday, June 11. The marine survey work will involve one research vessel towing a survey instrument mounted on a sled. The sled will be towed along the seafloor over the submarine cable in a manner parallel to the cable in increments spaced approximately 1 kilometer apart. Please note that the exact coordinates of the cable’s position will be confirmed and made available shortly after installation is complete. For additional versions of this map (including LORAN), please click here. This document addresses a number of questions that have been asked of us throughout the project. Click on the document to enlarge. 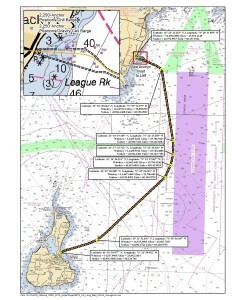 This document provides a plan to identify fishing or other gear within the approved 200’ construction corridor and any additional safety zone that may be required by the US Coast Guard or by the captain of the DP Vessel prior to the start of each phase of cable installation to allow the owners of the gear to remove their gear. 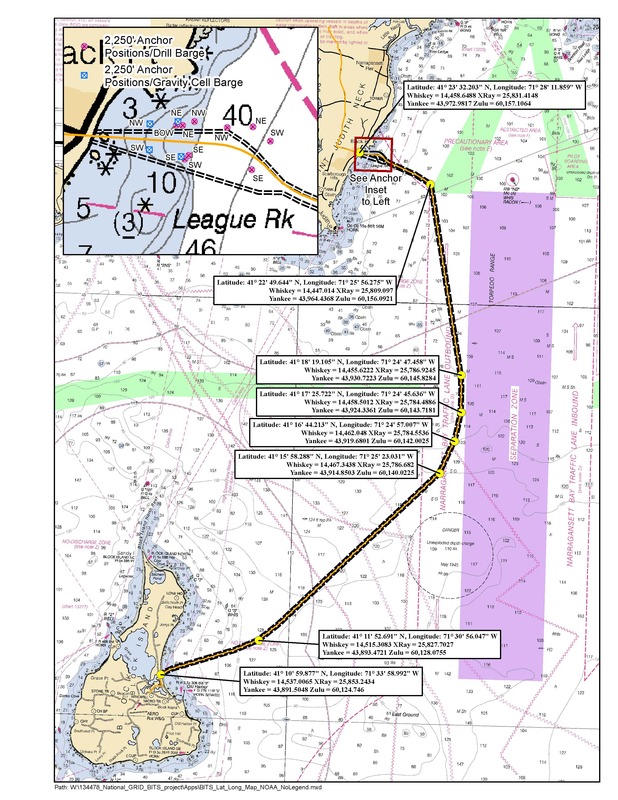 This notice provides details regarding the installation of the submarine cable.